Paul McCartney may not be looking for absolution, but he’s going to get some anyway. At the Tokyo Dome last Friday, the first of five concerts in Japan, he proved that he still has the wherewithal to put on a decent show, but his desire to make a political statement threatened to overshadow the proceedings. But Paul is still on the active list and as such is capable of recreating such bilge as “Put It There,” “When I’m 64” and “The Girl Is Mine,” which was also the nadir of Michael Jackson’s career. Mercifully, none of this was apparent at the Tokyo Dome. The only hint of danger was having wife Linda on stage behind a Union Jack and a banner reading “Go Veggie” – a curious way to address her husband. Linda gave the impression of being seated behind a keyboard, but whatever it was, it remained hidden by a curious collection of toys and the aforementioned flags. 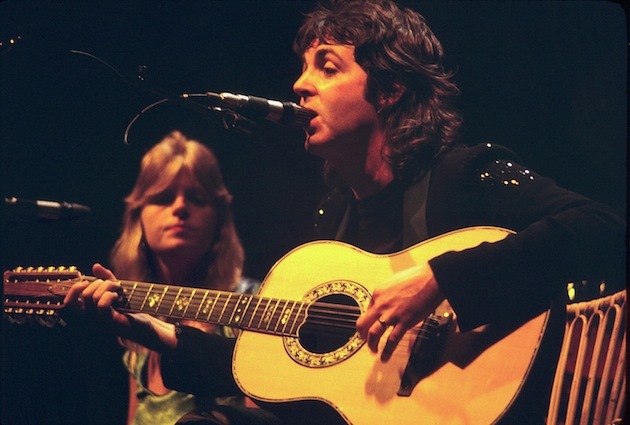 No aural evidence of a keyboard struck one’s sensory organs and requests to McCartney’s staff for a tape of Linda’s contribution to the gig were turned down. I concede that she was the best tambourine and maraca player of the day, but her presence still smacks of nepotism to me. The biggest compliment I can pay Linda is that she appears to be well ahead of Yoko “Let’s Karaoke” Ono. If the show was an overall plus, it started with a massive minus. As the fans entered the Dome, they were handed anti-vivisection leaflets, presumably at the instigation of the McCartneys. This was more or less confirmed by “Help – a Day in My Life,” a 10-minute video of Beatles songs and images from the ’60s. At least, that’s how it began. As the fans took in the sound of the Fab Four and watched the screens surrounding the stage, everything seemed happy enough. But as the video neared its climax, the images changed to pictures of nice animals, and then we saw a bullfight, cows being roped in a rodeo, harpoons piercing whales, toxic waste being dumped in the sea, a Greenpeace inflatable under attack. Then the pictures became more sinister, showing animals in labs undergoing cruel experiments and having various parts of their bodies ripped apart in the name of science. It was disgusting and, Paul and Linda, you have succeeded in converting one lost soul – I am never going to eat monkey meat again. But the most sinister part about the video was the fact that Paul was using Beatles music to soften the blow. The whole thing was reminiscent of Alex’s treatment in the movie “A Clockwork Orange,” when he is drugged and shown violent films that make him throw up, so putting him off violence. Because the soundtrack contains the one beautiful thing that Alex can appreciate – classical music – the treatment effectively kills off any pleasure he derived from music as well as violence. No one can deny Paul’s right to fight for a cause, but his fans go to see him for his music, not for his politics. Japanese fans, who never get an opening-band warmup despite paying the highest ticket prices in the world, have a right to have their precious leisure time unsullied by such liberties. As for the concert itself, at least McCartney left most of his own material out of it. As in his 1990 world tour, he relied largely on Beatles numbers to carry the show, the difference being that this time around they had a bit of life to them. Baker also confirmed that McCartney’s current “New World Tour” is not his final tour, contrary to rumours in the Japanese press. Judging by the quality of the music in last week’s show this is a good thing. The whole show was a vast improvement over his last effort three years ago. Everything was much simpler. There were no gimmicks; the light show and set were spare (just a couple of explosions during “Live and Let Die”); and Paul laid off the patronizing patter (his previous attempts at simple English for the Japanese were far closer to simpleton’s English – this time round he spoke a bit of Japanese, but mercifully all communications were kept to a minimum). Basically, Paul let his music do the talking for him and on that score he was a winner all the way. Having been together for some time now, the band showed the value of not messing around with a winning team. Guitarist Robbie McIntosh was nothing short of brilliant, providing some real feeling to numbers that had previously been numbed by overexposure and taking a load off McCartney at the same time. But the biggest plus of the night was Paul himself. Paul has always been thought of more as a songwriter than anything else, but listen to any Beatles record and you will discover a truly stunning bass player and a closet Little Richard bursting out. After the band’s mediocre performance three years ago, there was little point in hoping to see anything new. But at the age of 51, Paul can still belt with the best of them, and on numbers such as “Let Me Roll It,” “Can’t Buy Me Love” and “Magical Mystery Tour,” he wasn’t holding anything back. The biggest disappointment was the absence of McCartney’s one solid classic as a solo artist, “Maybe I’m Amazed,” but “Live and Let Die,” with one of the great riffs of the ’70s, went some way to making up for it. Paul may not be the most likeable ex-Beatle in the world, but as a live performer, he showed he still has the cojones to live up to his illustrious past. Whether or not he has the cojones to lose his tambourine player is a different matter. This entry was posted on Tuesday, April 5th, 2011 at 7:28 amand is filed under . You can follow any responses to this entry through the RSS 2.0 feed. You can leave a response, or trackback from your own site.